We have roughly 40 icons for common characteristics that we use. Any other characteristics are represented by text only. 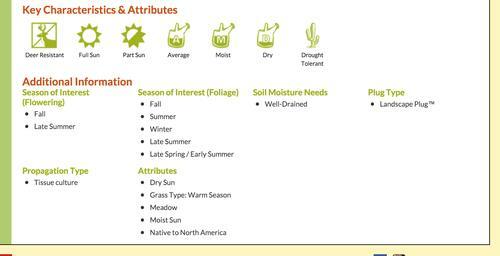 You can easily select the appropriate characteristic attribute for each plant in your library. You have complete control to add unlimited Characteristics, like 'Sun Requirement' and corresponding attributes like 'Full Sun', 'Part Sun', 'Shade'. Simple click on the relevant atttributes for each plant and the information will be immediately associated with that plant record. 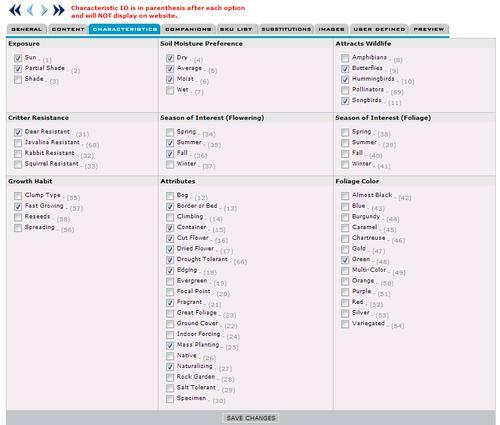 You can use the Genus Overview Editor to add and/or update characteristics to your plant library in bulk. if you have a detailed plant search implemented on your site, you site visitors can select the attributes of their choice plus additional search criteria to find the perfect plant. We have created icons for many of the common attributes and offer those for use on your website as well. With this module, you have complete control over the Characteristics (i.e. 'Sun Requirement') and corrsponding attributes (i.e. 'Full Sun', 'Part Sun', 'Shade').